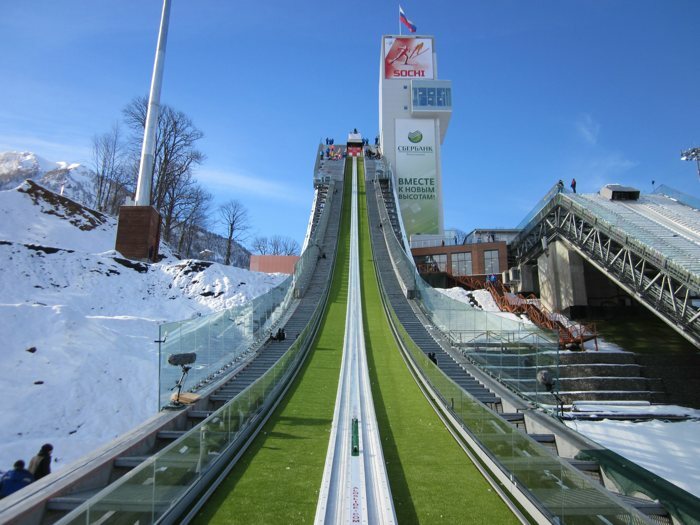 Olympic ski jumping hill in Sochi with an inrun track from CeramTec. Made in Germany. From February 7th-23rd, 2014, all eyes will be on Russia for the XXII Olympic Winter Games in Sochi. The best ski jumpers in the world will compete in the Nordic combined and ski jumping events in the RusSki Gorki Jumping Center. Here, both the normal hill and the large hill have been equipped with ALOSLIDE® ICE technology from CeramTec. The inrun track system enables athletes to jump in perfect conditions, regardless of the weather. ALOSLIDE® ICE is a one-track inrun system outfitted with ceramic nubs that are vulcanized in special caoutchouc in a scientifically tested design. A cooling unit integrated into the system creates a stable layer of ice 20 mm thick in good snow conditions and in temperatures up to +15°C. An integrated ice cutter and brushes regulate the thickness of the ice and prepare it. The system can be switched easily from summer to winter operation or vice versa without the need for additional ice or snow. In summer, jumpers slide down the take-off ramp to the launch pad right on the ceramic nubs. This technology allows ski jump events to take place year-round in practically identical conditions. Sergey Zyryanov, Chief of Hill for the Olympic ski jumps in Sochi, put the system to a test last October at an outside temperature of 18°C. He is thrilled with it, saying, “The ice formed and stayed. Neither the summer temperatures nor the steady rain that began a short time later were a match for the ice track.” Hydroplaning and puddle formation are a thing of the past thanks to this system, making additional drainage ditches in the ice unnecessary. Operating the system is easy. “You simply press a couple of buttons and in just a couple of days the track is complete,” explained Zyryanov. This is not the first time ALOSLIDE® will be used in large competitions. The inrun track system allowed competitions to take place under optimal conditions back in 2006 at the Olympic Winter Games in Turin. In 2011, this German technology was also featured at the Asian Winter Games in Almaty, Kazakhstan. In the last five years, their system has been running reliably and without interruption from November to March. ALOSLIDE® proved itself successful at the facilities in Oberstdorf, Germany and Bischofshofen, Austria, for the Four Hills Tournament and in Klingenthal, Germany, home to the FIS Summer Grand Prix and the 2013 FIS team tour. Both the athletes and Werner Schuster, head coach of the German ski jumping national team, praised the CeramTec technology.